Salon, an 18th century French term for a large social room used for receiving and entertaining guests, describes the spatial composition of a commercial interior that simulates a domestic ambiance, but remains a showroom space. Salon describes an elegantly furnished, domestically scaled space in a retail interior that is used for the reception of clients who are treated like guests in a home. In his use of the salon, Worth was probably the first couturier to realize the potential of interior design and its power for retailing. He purposefully used the décor of his salon to reinforce the style and quality of his clothing designs and reflect his own self-identity as a designer - the beginnings of a brand. Salon has appeared most commonly in higher-end clothing and accessories stores. The key to Salon as a contemporary retail design strategy is fostering retail environments that facilitate highly personalized customer and provide a luxurious atmosphere. A distinction is to be made between retail settings where chairs or benches may be provided as resting points for shoppers or their companions and true applications of Salon where the furniture groupings are in fact arranged to support a certain level and style of sales service. Small conversational groupings of seating that create a domestic ambiance but do not actively support the traditional one-on-one salon sales technique would not be considered instances of Salon according to the definition. The furniture groupings are not usually arranged to encourage conversation or social interaction. Salon was identified and defined in the previous study of retail and is being revisited within the context of this study.1 The name references the traditional understanding of the French word salon, meaning a well-appointed room in a palace or large home for receiving guests.2 Further study of this intype has uncovered an additional layer of meaning extending beyond providing a domestic setting within a retail space. The practice appears to have originated with the salons of the Parisian maisons de couture, or fashion houses, of the mid-19th century. The salon model was later adopted as both a retailing and interior design strategy for selling clothing and other luxury goods requiring high levels of customer service. As an archetypical practice, Salon can be traced back to Parisian couturiers use of salons in the 1850s. A brief discussion of the development of the salon technique for selling couture garments and accessories within the historical context of the development of modern haute couture is helpful for understanding the origins of the intype. Haute couture literally translates from French as "high sewing," but is used to describe fashion designed by a professional designer that is of the highest quality and usually created for a specific client. Although the term is used colloquially to refer to many different things, strictly speaking the term refers to fashion produced by members of La Chambre Syndicale de la Couture, the French organization that oversees the Parisian fashion industry.3 Charles Frederick Worth, a famous Parisian couturier considered to be the father of haute couture, is credited with freeing fashion from its aristocratic hold and consequently developing the contemporary business model for the couture industry.4 It is the organization of this couture business within a maison de couture in which the salon archetype materialized. Maisons de couture were quite literally old mansions or large homes in Paris that couturiers used as places of business. The fashion houses were traditionally organized with ateliers, or workshops, for crafting smaller garment pieces on the top floors, followed by office spaces and oftentimes entire floors for larger pieces like suits and dresses on the middle floors, and finally showrooms, salons, and a reception desk for inquiries on the lower floors. Even to this day, couture clothing companies are referred to as "houses" (short for "fashion house"), with many still occupying old mansions as their headquarters.5 The old home's salon space was repurposed for a similar function of receiving guests, still "furnished to resemble the drawing rooms of well-appointed houses. "6 The salon became a retail space for clients to be fitted for couture fashion, different from the traditional method where a dressmaker would have traveled to a client's home for consultations and fittings. A large component of the salon method was the use of live models to show clothing in an early version of the fashion show. This use of live models and fashion shows was an act of convenience for potential clients, offering a high level customer service: "dressmakers...devised the fashion-show formula so that their customers would not have to muss their hair or remove their clothes. They employed mannequins to slip on the clothes and parade them before potential clients. "13 It quickly becomes apparent that the design of these early salons was intended not only to support luxury couture and personal customer service, but to facilitate the viewing of these live fashion shows. Seating played an important role for both customer service and fashion show purposes, and is a topic worth dwelling on. Chairs and sofas were often scattered around the salon, leaving much empty space in the center to allow for easy viewing of the parade of live models. As a result, the layout of the furniture was usually sociofugal, meaning that the seating arrangement was not intended to promote or be especially conducive to conversation with others. Edward T. Hall discussed this relationship between furniture and socialization in The Hidden Dimension. He differentiates between such sociofugal seating arrangements and sociopetal ones, where furniture is arranged in groupings that bring people closer together and promote social interaction.14 Hall's identification of these two types of seating arrangements is helpful in understanding the difference in strategy between true instances of salon and other seating groupings in retail interiors that are used more for hospitality and creating a domestic ambiance. Many stores offer small groupings of comfortable chairs and sofas, often arranged facing one another in a manner that resembles the conversational furniture arrangements one would find in the living room of a home. Face to Face, an intype found in workplace, seems to be used fairly frequently in retail interiors to create these domestic settings, having two lounge chairs placed opposite another pair of chairs or a sofa.15 These groupings would all be considered sociopetal in nature since they place users within close proximity and opposite one another to allow for easy conversation. Seating groupings constituting a Salon, however, would be characterized as sociofugal, since the chairs and sofas are usually scattered throughout the interior and are arranged to face towards a fashion show or particular display area rather than in clusters facing other seating. This distinction indicates that a conversational, domestic furniture grouping does not necessarily connote an instance of Salon. The strategy is more about the actual function as a sales space rather than simply providing hospitality with a nice lounge area; true examples of Salon use seating as only one component in creating an elegant room in which to conduct the sales of luxury goods, referencing the original salons in the Parisian fashion houses like Charles Worth's. Mathilde Bonaparte may have been experiencing the salon when the industry was still in a period of flux. The beginnings of the democratization of fashion allowed for a much wider circle of people to visit salons. This larger audience for couture perhaps created different dynamics that were less conversational than a small group of elites, like Bonaparte and her peers, that would regularly visit the salon and talk politics over clothing fittings. Although couture salons may initially have encouraged conversation due to social circumstances, as demonstrated anecdotally, their design seems to indicate that, physically, the furniture groups are for receiving service and viewing product and not specifically intended for conversation. While seating arrangements play an important role in the social and behavioral understanding of Salon, they are but one among several key design characteristics associated with the intype. The beautifully appointed Dior salon likely contributed to its success: "The new maison stood in stark contrast to the older houses, whoseinterior styles were well known; they had become run-down during the war... The immaculate, fresh-painted rooms with a patina of French history created by the neo-Louis XVI décor excited buyers, press and public alike. They were fascinated to experience a new mood that could blow away the wartime cobwebs. "22 It is interesting to note that patrons associated the interiors of couture salons with their overall impression of the fashion house. Dior's particularity over the décor of his salon was therefore quite fitting. He hired a designer to outfit his salon, emphasizing that he wanted an interior that would serve as background to his clothing, highlighting but never distracting from the clothing as the focal point of the space.23 The salon was described as having gray draperies, gray rugs, gray stain chairs and settees. The grand salon "has an ornate crystal chandelier, marble fireplace, lavish lilacs in vases and makes you feel you've blundered into the drawing room of some beautifully appointed hotel particulier rather than a place of business. "24 Gray furnishings and accessories were used to provide the neutral background that was intended to promote the clothing as the focal point. Other design elements, such as the chandelier, marble fireplace or fresh-cut flowers all contributed to the creation of an atmosphere of luxury to match the high level of quality and service associated with custom couture. Since part of the motivation for importing French fashion was the prestige, it follows logically that the modes for selling the couture clothing would be mimicked as well. The use of a luxurious, well-appointed salon would create an interior space in which to simulate for clients the experience of purchasing haute couture in Paris. While department stores were incorporating salons as parts within their expansive stores, there is also evidence that smaller specialty stops were also adopting the salon as a retail typology around the same time. Architect José Fernandez offered guidance about the salon-type store in his book, The Specialty Shop (A Guide), published in 1950 as a guidebook for architects designing small shops.27 He explained that a salon was an appropriate model for selling products that were high in cost and need not be sold in large quantities to be profitable, including fur, jewelry, cosmetics, or other decorative items. Few products would be on display, since live models were used for showing clothing items or products would be shown one-on-one. He emphasized that this level of high customer service was achieved by treating the small client base as "distinguished guests," rather than customers, the language reminiscent of the salon's origin as a room for greeting guests in a home. 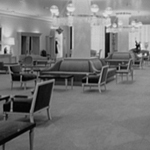 Fernandez echoed the design intentions of the original salons in his call for store interiors that represent the luxury, style, and quality of the products for sale: "Atmosphere is achieved in the luxury shop by thick carpets, very comfortable furniture, soft lighting, the acme of good taste in color, with perhaps soft music, and a faint perfume. Tea or cocktails may be served at appropriate times. Everything must contribute to the over all impression of superiority. "28 These salons of the mid-20th century were probably the closest interpretations of the original couture salons in retail applications, as well as the purest examples of the Salon intype. Given the labor shortages during the war, stores were forced to cut back their sales force, which left little choice but to adopt a more self-serve approach for customers. Retailers noted that sales were increasing as a result of customers being able to interact with the merchandise, so they kept the self-service model even after the war had ended. Although higher-end specialty stores may have still offered high levels of customer service, self-service was becoming the standard in retail beginning in the 1940s.30 In addition to product packaging and labeling, store interiors were starting to be designed to allow for self-service. For example, paths through the store were clearly articulated for easier wayfinding, and products were organized and classified for easier comparison shopping.31 Whereas salons were designed initially for the viewing of live models and hand-holding service throughout the process, the new self-service-oriented stores would have instead offered fitting rooms for trying on clothing and a customer's interaction with a salesperson might not occur until the point of purchase. This trend towards designing retail interiors that supported self-service likely contributed to the decline of the salon's service-oriented environment, since the primary focus of the salon as a design strategy had been to facilitate the specialized customer service. As dressmaking salons were closing, boutiques were becoming increasingly popular, overshadowing the once dominant department stores. While some boutiques still did offer haute couture, most were selling the new, ready-to-wear designer clothing, playing a pivotal role in the democratization of fashion, especially to the younger generations.34 Fashion designers were sensitive to the trend, as exemplified by Yves Saint Laurent's successful Rive Gauche ready-to-wear collection launched in 1966.35 As a result, ready-to-wear's popularity in both boutiques and department stores alike contributed to the decline of haute couture, and consequently the disappearance of the true salon. Since the decline of the salon's traditional role in haute couture, the classic couture retailing model has experienced a somewhat divergent evolution. In one respect, the salon has lived on in the maisons de couture in Paris, granted in a more modern interpretation. To this day many fashion houses in Paris still have salons. If a French couturier is a member of the official industry trade association, La Chambre Syndicale de la Couture, they have the privilege to show their collections twice a year on the official calendar.36 At these times the couturiers are required to open up their salons to anyone who wants to come regardless of whether they intend to make a purchase.37 A 1981 New York Times article described this biannual event: "As recently as the early 1980s, the couture houses showed their collections repeatedly over a two-month period in the comfort of their own salons. However, as the runway shows developed into theatrical spectacles by the end of the decade, this practice changed. "38 Elaborate, flashy fashion shows have since replaced the traditional, tame parade of models in a couturier's salon. Many of the Parisian fashion shows are now held in much larger event spaces, including auditoriums at the Louvre.39 Although the fashion houses do still have salons, the spectacle of the fashion show has shifted from the small venue of the salon to the grander venues that can accommodate larger audiences. The evolution of the salon that is of more interest includes the remnants of the design strategy in contemporary retail interiors, expressed as Salon (the intype). As will become more apparent in the chronological sequence, salons functioned fairly similarly to the original Parisian couture salons up until the period of transition towards increased self-service and ready-to-wear clothing in the 1960s and 1970s. From the mid-20th century onwards, Salon appears in varying degrees of intensity. Stores seem to interpret the salon typology depending on their level of service offered. For example, high-end jewelry or shoe stores will use Salon because of the level of personalized service associated with acquiring those products. Salon also often appears in contemporary fashion retail almost paying tribute to their roots in haute couture, even if the intention is not for the salon to allow for the viewing of live models. At the opposite end of the spectrum, there are some truer examples of Salon. Some modern retailers have designed their shops as elegant, domestic interiors that display little product because the clothing items are shown and fitted on an individual basis, like wedding gown boutiques. The Chronological Sequence will be especially helpful for Salon in the ability to visually track this evolution from the earlier expressions in the 1950s and 1960s of actual salons within department stores and specialty shops to the more contemporary interpretations of Salon as luxurious, domestic settings in high-end stores associated with personal service. The strategy was very much one of exclusivity: "Kniže, whose chairs and small salons continue the architectural arrangements of the late nineteenth century, is both inviting and exclusive, such as in the closed shops - maisons - where one had to ring the bell to be admitted or even had to make an appointment...Some luxury boutiques reacted to the phenomenon of the department store by becoming (or like Kniže remaining) even more exclusive. Their definition of luxury was quasi-aristocratic and totally personalized. Their customers, ensconced in an intimate salon reserved exclusively, albeit temporarily, just for them, were pampered from the moment they set foot in the door. "42 The generous club chairs and lack of product displayed exhibited this level of personalized service that one could expect at Kniže. Within the context of department stores' increasing access to clothing, specialty shops like this one leveraged Salon as a tool for creating an environment that facilitated and communicated selectiveness. Department stores eventually caught on to the practice and adapted it as a specialty department within their stores, as seen by this New York City Bergdorf Goodman (1956).43 Here the salon model from the French fashion houses was interpreted through various seating groupings scattered throughout the room, presumably to allow for the viewing of a live fashion show where the clothes would be modeled. In this case the salon was specifically a coat and suit department, both garments that can benefit from custom tailoring at higher-end stores.44 Closets concealed clothes behind sliding doors. Such product storage is suggestive of the level of customer service associated with a salon. Salespeople assisted customers one-on-one to show them the clothing. The couturier shop at Philadelphia's Bonwit Teller (1963) is another department store's interpretation of the classic couture salon, complete with chandeliers, grand columns and seating arranged for the viewing of live models.49 Although this instance of Salon is very similar to that from the previous decade, comparison with another department store photographed in the same year provides evidence for the beginnings of a transitional period. The Joseph Magnin Store (1963), a specialty department store in Oakland, California, interpreted Salon in a more modern way.50 The 1960s in the United States was a period where self-service became the standard in retail and youth represented an increasingly important clientele for fashion designers and retailers. Catering towards self-service and youth were both apparent in Joseph Magnin. The furniture and light fixtures were still present as fundamental components of the Salon, but ‘3LC' or ‘T Chair' by Katavolos, Littell & Kelly (1952) were more modern than the traditional Louis XVI-style furnishings that often referenced the classic couture salons. More clothing was also displayed on the sales floor, where Salon has typically featured little product. It is possible that this increase in product displayed allowed for customers to help themselves to the clothing on the racks, with the potential for one-on-one service that would have been supported by the seating provided if need be. There would continue to be classic instances of Salon into the 1970s but matched by an increasing number of modern versions. Saks Fifth Avenue (1966) in Palm Beach, Florida demonstrated how some department stores held on to the traditional Salon, creating for customers a classically elegant interior that referenced ties to Parisian couture.51 This department store salon was extremely residential in feel due to the lower ceiling height, chandeliers and hearth. Even several years after the Joseph Magnin example, in a high-end department store, product was still primarily displayed behind closed doors for salespeople to bring out for customers. The shoe salon, too, was reinterpreted in the 1960s, as seen by Elkins Shoe Store (1967).52 Shoes are a classic product for the salon typology because of the level of service required in higher-end shoes stores. Shoe departments or shoe stores are still called "shoe salons" in many cases. With usually only one pair of each style of shoes on display and the stock stored in a back stock room, salespeople retrieved the proper size for customers and help them find the right style and fit. Some shoe stores have solved the need for serving many customers simultaneously in the most efficient way possible, simply by rowing up chairs in long lines or using circular benches. However, some instances of shoe salons do reference the Salon intype. Elkins shoe store is one of these examples, where groupings of sofas and ottomans appeared more residential in scale again in a more modern version. The light fixtures, too, brought the light level down to a person's height, also contributing to a more domestic setting. Later in the 1960s, the influences of the powerful youth demographic and popular boutique typology influences truly became apparent. The Young Bendel Shop (1967) is an example of the response to these influences.53 Minimal product was displayed, but the open-access racks would have allowed for self-service. Again a characteristic Salon furniture grouping was updated with modern chairs and sofas. By the 1970s the more mainstream, high-end department stores also began to consistently show more modern versions of Salon in addition to the smaller boutiques or specialty department stores. Comparison of two Bonwit Tellers-one from Chicago (1970) and one from several years later in Beverly Hills (1973)-sheds light on the nature of modern influences. The Chicago store is still very much a classic salon.54 The store boasted a mix of reproductions and antique furniture and accessories, including Louis XVI-style chairs. Shown in the color image on the left, an oak parquet floor and oriental rug contributed to its domesticity. The shoe salon shown in the image on the right features what was described as "Dior Gray" wool carpeting, as well as a chandelier and more Louis XVI chairs.55 The use of traditional furniture and clear references to Dior's salon made for a rather classic application. The transition to more modern expressions of Salon was apparent in comparison with another of the chain's stores. Only three years later the salon in the Beverly Hills Bonwit Teller was outfitted with noticeably more modern furnishings and minimal décor.56 The sofa became more simplified and rectilinear in form, the mirrors also simplified and less ornamented. The light fixture was also no longer the classic chandelier. 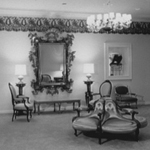 A Neiman Marcus (1973) from the same year in Dallas shows similar evidence of the updated Salon.57 The furnishings were more modern in appearance, but the furniture groupings were about the only elements of Salon present aside from individualized service that would still have been present. The fur salon in the image on the left features Face to Face, more associated with office settings than residential. The image on the right shows the department store's couture salon. Neither salon architecturally feels residential in scale or detailing. Salon as a typology still exists as a means for personalized sales service, however the interior design only features remnants of the true couture salon. A later Chicago branch of Neiman Marcus (1984) further validates Salon's straying from its original form.58 Pictured again were the fur and couture salons. Even more so than in the Atlanta Neiman Marcus, these salons read even less like domestically-scaled rooms and instead as departments within a department store. In the midst of the true salon's decline there were occasional cases of authentic contemporary salons. Jasmin by Appointment (1990) was a San Francisco fashion salon where personal meetings were made with Jasmine, who would consult with clients on European prêt-a-porter or ready-to-wear clothing.59 Although the garments were not custom couture, the interior channeled the traditional couture salon. No product was shown on display. Seating was clustered by a fireplace, or at a small meeting table where clothing was hand-selected and shown to clients. This interior is an example of White Out (Intype), with the all white materials and finishes contributing to the atmosphere of luxury of the salon. This modern Salon has likely eliminated the tradition of the live model, offering a fitting room area with a tri-fold mirror for trying clothes on in its place. Although this type of fashion salon is atypical in modern times, it is evidence of occasional references to the traditional fashion retailing practices. The Salon typology has also been used as a strategy for establishing spatial identity for a particular department within a department store. Ralph Lauren is well-known for his branded environments, even within department stores like Bergdorf Goodman Men (1991) in New York.60 The intype was used here more for concept than function. The furniture was domestically scattered around the hearth while the materials, finishes and lighting contributed to a luxurious but welcoming ambiance. However, this type of branded department in a contemporary department store would have been self-serve; sales associates might have assisted in the selection process, but their primarily involvement was at the point of transaction. As a result, the notion of Salon is present as a theme for the interior design of the department but the strategy was not intended to support custom couture or tailoring. Shoe departments and stores are one retail typology where Salon has continued to appear, still drawing upon the original shoe salons given the personal sales attention associated with trying on shoes. Salvatore Ferragamo (1997), an Italian shoe and luxury leather goods designer, usually features the shoe salon as the largest room in his shops.61 In his New York flagship, contemporary armchairs were featured rather than the classic Louis XVI chairs and were arranged in a Face to Face layout rather than scattered around the room. It is interesting to note how the black armchairs created a more masculine atmosphere for selling men's shoes in this case, whereas salons were traditionally associated with women's couture. Returning to the shoe salon, Bergdorf Goodman (2004) exemplified the relevancy of the shoe salon in contemporary department stores.65 The atmosphere became less residential than it traditionally was, however the interior design still functioned as a strategy for creating an elegant, domestically-scaled space in which to conduct one-on-one sales interactions. Although Salon has typically been associated with women's clothing, Tom Ford's New York boutique (2007) demonstrates how the typology has successfully been adapted to menswear.66 Suits are one garment in modern society that are still frequently custom-tailored, so it was appropriate that Salon appears for such a purpose. The traditional domestic seating area was still present with a more masculine twist, still organized around a hearth. The cases on the right contained suits that were shown to prospective customers, reminiscent of the earlier instances of closed storage for clothing to be brought out by a salesperson. Hugo Boss (2009) was another menswear store that utilized Salon, but only in pieces.67 Instead of supporting custom tailoring, remnants of Salon first appeared in the shop's shoe department shown in the image on the left. This was a much less honest interpretation of Salon, but Salon nonetheless in the domestic seating arrangement provided for service when trying on shoes. The chairs were very masculine in nature, looking as if they were pulled out of a gentleman's club. The same chairs also appeared outside the fittings rooms. This was another instance where Salon is no longer facilitating a live fashion show, but appearing as a residual element in the self-serve dressing room area. Jewelry, too, is a product in modern society that still warrants a salon model of retailing due to its high price point. One of the rooms in Tiffany & Co. (2009) located in Japan's prestigious Ginza shopping district is an example of Salon applied to a jewelry store.68 Only a few showpieces were featured in vitrines, while other products were brought out by a salesperson. Several design elements, including the stone floors, Light Seam, and textile wall treatments, contributed to a high-end setting appropriate for selling expensive jewelry. Area rugs clustered the furniture groupings into distinct zones for separate customers. The Salon-style seating was rather telling of the type of service offered here. The two seating groupings in the front of the image included a small stool opposite the sofas and chairs. Perhaps the stool functioned as an easily accessible perch for the salesperson to facilitate face-to-face communication with potential customers when showing merchandise. A final example offers evidence for Salon's current use in department stores. The seventh floor of Barney's New York (2009) was dedicated to a made-to-measure men's suiting department, providing seating for consultations and a mirror for fittings.69 Over the past decade, Salon has become most relevant for bridal boutiques for women, made-to-measure suiting for men, and other luxury goods, such as high-end shoes or jewelry, which require personal service from a sales associate. Perhaps salon is making a comeback in contemporary retail interiors, as many examples were found in the latter part of the 2000 decade. 1) Leah Scolere, Retail, "Theory Studies: Contemporary Retail Design," (M.A. Thesis, Cornell University, 2004), 47-51. 2) Oxford English Dictionary Online, "salon," http://www.oed.com/view/Entry/170106?redirectedFrom=salon (accessed Mar. 8, 2011). 3) Jennifer Craik, Fashion: The Key Concepts (Oxford: Berg, 2009), 73. 4) Craik, Fashion: The Key Concepts, 69. 5) Van Dyk Lewis (Professor, Fiber Science and Apparel Design, Cornell University), conversation with author, March 11, 2011. 6) Penny Sparke, "Interior Decoration and Haute Couture: Links between the Developments of the Two Professions in France and the USA in the Late Nineteenth and Early Twentieth Centuries: A Historiographical Analysis," Journal of Design History 21, no. 1 (Jan. 2008): 103. 7) Sparke, "Interior Decoration and Haute Couture," 103. 8) Pamela A. Parmal, "La Mode: Paris and the Development of the French Fashion Industry," Pamela A. Parmal, Didier Grumbach, Susan Ward, Lauren D. Whitley, & Museum of Fine Arts, Boston, Fashion Show: Paris Style (Boston, Mass: MFA Publications, 2006), 63-64. 9) Sparke, "Interior Decoration and Haute Couture," 103. 10) Parmal, "La Mode," 66. 11) Parmal, "La Mode," 66. 12) Parmal, "La Mode," 66-68. 13) Bernadine Morris, "Passport to Paris Fashion: You Don't Have to Be Rich or Famous to Get a Good Seat at an Haute Couture Show," The New York Times (Nov. 29, 1981). 14) Edward T. Hall, The Hidden Dimension (Garden City, N.Y.: Doubleday, 1966), 108. 15) Face to Face (Intype) is a formal furniture arrangement in which two lounge chairs are aligned to face two other lounge chairs or a sofa for conversation or waiting. With or without an area rug, the composition defines a spatial area. Shuqing Yin, "Theory Studies: Archetypical Workplace Practices in Contemporary Interior Design," (M.A. Thesis, Cornell University, 2011), 145-59. 16) Parmal, "La Mode," 66. 17) Craik, Fashion: The Key Concepts, 69. 18) Alexandra Palmer, Dior: A New Look, A New Enterprise (1947-1957) (London: V & A Publishing, 2009), 13. 19) Craik, Fashion: The Key Concepts, 72. 20) Parmal, "La Mode," 80-81. 21) Maison de Christian Dior at 30 Avenue Montaigne  Anonymous, Architecture; Paris, France in Palmer, Dior, 23. 23) Salon, Maison de Christian Dior at 30 Avenue Montaigne  Anonymous Designer; Paris, France in Palmer, Dior, 24. 24) Paul E. Deutschman, "How to Buy a Dior Original," in Palmer, Dior, 24-25. 25) Parmal, "La Mode," 78; Jan Whitaker, Service and Style: How the American Department Store Fashioned the Middle Class (New York: St. Martin's Press, 2006), 220. 27) Jose A. Fernandez, The Specialty Shop (A Guide) (Cornwall, NY: Architectural Book Publishing Co., Inc., 1955), 131. 28) Fernandez, The Specialty Shop, 131. 29) Whitaker, Service and Style, 239. 30) Whitaker, Service and Style, 240. 31) Sophie Duibuisson-Quellier, "The Shop as Market Space: The Commercial Qualities of Retail Architecture." eds. David Vernet and Leontine de Wit, Boutiques and Other Retail Spaces: The Architecture of Seduction (New York: Routledge, 2007), 20. 32) Craik, Fashion: The Key Concepts, 75. 33) Didier Grumbach, "Haute Couture and Ready-to-Wear: A Recent History," Pamela A. Parmal, Didier Grumbach, Susan Ward, Lauren D. Whitley, & Museum of Fine Arts, Boston, Fashion Show: Paris Style (Boston, Mass: MFA Publications, 2006), 92. 34) Sharon Zukin, Point of Purchase: How Shopping Changed American Culture (New York: Routledge, 2004), 134. 35) Grumbach, "Haute Couture and Ready-to-Wear: A Recent History," 92. 36) Morris, "Passport to Paris Fashion." 37) Van Dyk Lewis (Professor, Fiber Science and Apparel Design, Cornell University), conversation with author, Mar. 11, 2011. 38) Morris, "Passport to Paris Fashion." 39) Parmal, "La Mode," 83-85. 40) Salon, Kniže  Adolf Loos; Vienna, Austria in Sophie Dubuisson-Quellier, "The Shop as Market Space: The Commercial Qualities of Retail Architecture," eds. David Vernet and Leontine de Wit, Boutiques and Other Retail Spaces: The Architecture of Seduction (New York: Routledge, 2007), 16; PhotoCrd: Albertina. 41) Panayotis Tournikiotis, Adolf Loos (New York: Princeton Architectural Press, 1994), 49. 42) Dubuisson-Quellier, "The Shop as Market Space," 18. 43) Bergdorf Goodman  S.S. Silver Interiors; New York City in Anonymous, "The New Miss Bergdorf Shop," Interior Design 27, no. 1 (Jan. 1956): 73-77; PhotoCrd: Anonymous. 44) Anonymous, "The New Miss Bergdorf Shop," 73. 45) Edith Meiser Salon  Jack Daley; Erie, PA in Anonymous, "Stores," Interior Design 30, no. 4 (Apr. 1959): 180-81; PhotoCrd: Anonymous. 46) Anonymous, "Stores," Interior Design 30, no. 4 (Apr. 1959): 181. 47) Park Avenue Room, Saks Fifth Avenue  Ernest Bonnamy, Kahn & Jacobs; New York City in Anonymous, "Stores, " Interior Design 32, no. 4 (Apr. 1961: 185; PhotoCrd: Martin Helfer. 48) Anonymous, "Stores," Interior Design 32, no. 4 (Apr. 1961): 185. 49) Couturier Shop, Bonwit Teller  Lenore Ranes, A.I.D. ; Philadelphia, PA in Anonymous, "Portfolio of Work by Members of Eastern Pennsylvania Chapter, American Institute of Interior Designers," Interior Design 34, no. 3 (Mar. 1963): 142-43; PhotoCrd: Hans Van Nes. 50) Joseph Magnin Store  Victor Gruen Associates; R.L. Baumfeld, Partner in Charge; Oakland, CA in Anonymous, "West Coast Downtown Store on One Level," Architectural Record 133, no. 7 (Jun. 1963): 164-65; PhotoCrd: Morley Baer. 51) Saks Fifth Avenue  David Ayers, A.I.D. ; Palm Beach, FL in Anonymous, "Palm Beach Salon," Interior Design 37, no. 4 (Jun. 1966): 210-11; PhotoCrd: Mort Kaize Studios. 52) Elkins Shoe Store  William Riseman and Associates; Boston, MA in Anonymous, "Boston Shoe Store Remodeling Accomplished for Total Budget of $20,000," Architectural Record 141, no. 5 (May 1967): 176-77; PhotoCrd: Maris (ESTO). 53) Young Bendel Shop  H. McKim Glazebrook; New York City in Anonymous, "Pour Madame: Henri Bendel, Bergdrof-Goodman, Lee Brous Frock and Bonnet Shop," Interior Design 38, no. 2 (Feb. 1967): 116-19; PhotoCrd: Anonymous. 54) Bonwit Teller  Copeland Novak & Israel in association with Harry L. Hinson III, AID; Chicago, IL in Anonymous, "This Specialty Store is Special," Interior Design 41, no. 4 (Apr. 1970): 138-45; PhotoCrd: Idaka (color photo), Henry S. Fullerton III (black and white). 55) Anonymous, "This Specialty Store is Special," 145. 56) Bonwit Teller  Harry L. Hinson III & Associates; Beverly Hills, CA in Anonymous, "Bonwit Teller in Beverly Hills: A New Branch by Harry L. Hinson & Associates," Interior Design 44, no. 3 (Mar. 1973), 92-99; PhotoCrd: Leland Lee. 57) Neiman Marcus  Eleanor Le Maire Associates, interior design; Carl Warnecke & Associates, architecture; Dallas, TX in Anonymous, "Symbol of Quality and Style: New Neiman Marcus Store Is Designed as a Symbolic Perpetuation of a Proud Reputation," Interior Design 44, no. 1 (Jan. 1973): 70-75; PhotoCrd: Alexandre Georges. 58) Neiman-Marcus  Warnecke/Le Maire; Chicago, IL in Monica Geran, "Neiman-Marcus in Chicago: The Retail Chain's Nineteenth Store Designed by Warnecke/Le Maire Ppens on Michigan Avenue," Interior Design 55, no. 7 (Jul. 1984): 206-13; PhotoCrd: Bob Shimer, Hedrich-Blessing. 59) Jasmin by Appointment  Bradley Rytz; San Francisco, CA in Lois Wagner Green, "Jasmin by Appointment: Bradley Rytz Designs a Suggestively Simple Fashion Salon in San Francisco," Interior Design 61, no. 6 (Apr. 1990): 182-85; PhotoCrd: John Vaughan. 60) Polo by Ralph Lauren in Bergdorf Goodman Men  J.T. Nakaoka Associates Architects; New York City in Grant Camden Kirkpatrick, AIA, Shops & Boutiques (Glen Cove, NY: PBC International, Inc., 1994), 72-79; PhotoCrd: Jaime Ardiles-Arce. 61) Salvatore Ferragamo  Kenne Shepherd; New York City in Edie Cohen, "Made in Italy: Kenne Shepherd Designs Men's and Women's Shops in New York for Ferragamo's Extensive Collections," Interior Design 68, no. 11 (Sep. 1997): 225-26; PhotoCrd: Toshi Yoshimi. 62) Carolina Herrera  Yabu Pushelberg; New York City in Edie Cohen, "Uptown Girl: Carolina Herrera Makes Her Mark on the Upper East Side in an Appropriately Luxurious Salon Designed by Yabu Pushelberg," Interior Design 71, no. 11 (Sept. 2000): 262-67; PhotoCrd: David Joseph. 63) Cohen, "Uptown Girl," 262-67. 64) Cohen, "Uptown Girl," 263. 65) Shoe Salon, Bergdorf Goodman  Randall A. Ridless; New York City in Maria Shollenbarger, "History for Sale: Randall A. Ridless Constructs a Francophile Fantasy for Bergdorf Goodman's Fifth Avenue Store," Interior Design 75, no. 11 (Sept. 2004): 228-35; PhotoCrd: Eric Laignel. 66) Tom Ford  Studio Sofield; New York City in Annie Block, "Best of Year: Fashion Retail," Interior Design 78, no. 15 (Dec. 2007): 70; PhotoCrd: Bill Jacobson. 67) Hugo Boss  Matteo Thun & Partners; New York City in Linda C. Lentz, "Matteo Thun Illuminates a New Concept for Hugo Boss in New York City," Architectural Record 197, no. 2 (Feb. 2009): 112-15; PhotoCrd: Paul Warchol. 68) Tiffany & Co.  Kengo Kuma & Associates; Tokyo, Japan in Naomi R. Pollock, "Kengo Kuma Creates a Luminous Jewel Box for Tiffany Ginza," Architectural Record 197 , no. 11 (Nov. 2009): 177-78; PhotoCrd: Masao Nishikawa. 69) Barney's New York  Lalire March Architects; New York City in Raul Barrenche, "Walk-Through: Well Suited," Interior Design 80 , no. 4 (Apr. 2009): 91-93; PhotoCrd: Eric Laignel. 70) David Vernet and Leotine de Wit, "The Vicissitudes of the Boutique: Introduction to the Case Studies and Interviews," eds. David Vernet and Leontine de Wit, Boutiques and Other Retail Spaces: The Architecture of Seduction (New York: Routledge, 2007), 42. 71) Fernandez, The Specialty Shop, 131. 72) Evidence for the archetypical use and the chronological sequence of Salon in retail interiors was developed from the following sources: 1910 Salon, Kniže  Adolf Loos; Vienna, Austria in Sophie Dubuisson-Quellier, "The Shop as Market Space: The Commercial Qualities of Retail Architecture," eds. David Vernet and Leontine de Wit, Boutiques and Other Retail Spaces: The Architecture of Seduction (New York: Routledge, 2007), 16; PhotoCrd: Albertina / 1940 Salon, Maison de Christian Dior at 30 Avenue Montaigne  Anonymous, Architecture; Paris, France in Alexandra Palmer, Dior: A New Look, A New Enterprise (1947-1957) (London: V & A Publishing, 2009), 24; PhotoCrd: Pat English, Time & Life Pictures/Getty / 1950 Bergdorf Goodman  S.S. Silver Interiors; New York City in Anonymous, "The New Miss Bergdorf Shop," Interior Design 27, no. 1 (Jan. 1956): 73-74; PhotoCrd: Anonymous; Edith Meiser Salon  Jack Daley; Erie, PA in Anonymous, "Stores," Interior Design 30, no. 4 (Apr. 1959): 181; PhotoCrd: Anonymous / 1960 Park Avenue Room, Saks Fifth Avenue  Ernest Bonnamy, Kahn & Jacobs; New York City in Anonymous, "Stores," Interior Design 32, no. 4 (Apr. 1961): 185; PhotoCrd: Martin Helfer; Couturier Shop, Bonwit Teller  Lenore Ranes, A.I.D. ; Philadelphia, PA in Anonymous, "Portfolio of Work by Members of Eastern Pennsylvania Chapter, American Institute of Interior Designers," Interior Design 34, no. 3 (Mar. 1963): 143; PhotoCrd: Hans Van Nes; Joseph Magnin Store  Victor Gruen Associates; R.L. Baumfeld, Partner in Charge; Oakland, CA in Anonymous, "West Coast Downtown Store on One Level," Architectural Record 133, no. 7 (Jun. 1963): 165; PhotoCrd: Morley Baer; Saks Fifth Avenue  David Ayers, A.I.D. ; Palm Beach, FL in Anonymous, "Palm Beach Salon," Interior Design 37, no. 4 (Jun. 1966): 211; PhotoCrd: Mort Kaize Studios; Elkins Shoe Store  William Riseman and Associates; Boston, MA in Anonymous, "Boston Shoe Store Remodeling Accomplished for Total Budget of $20,000," Architectural Record 141, no. 5 (May 1967): 176; PhotoCrd: Maris (ESTO); Young Bendel Shop  H. McKim Glazebrook; New York City in Anonymous, "Pour Madame: Henri Bendel, Bergdorf-Goodman, Lee Brous Frock and Bonnet Shop," Interior Design 38, no. 2 (Feb. 1967): 118; PhotoCrd: Anonymous / 1970 Bonwit Teller  Copeland Novak & Israel in association with Harry L. Hinson III, A.I.D. ; Chicago, IL in Anonymous, "This Specialty Store is Special," Interior Design 41, no. 4 (Apr. 1970): 144-45; PhotoCrd: Idaka (color photo), Henry S. Fullerton III (black and white); Bonwit Teller  Harry L. Hinson III & Associates; Beverly Hills, CA in Anonymous, "Bonwit Teller in Beverly Hills: A New Branch by Harry L. Hinson & Associates," Interior Design 44, no. 3 (Mar. 1973): 96; PhotoCrd: Leland Lee; Neiman Marcus  Eleanor Le Maire Associates, interior design; Carl Warnecke & Associates, architecture; Dallas, TX in Anonymous, "Symbol of Quality and Style: New Neiman Marcus Store Is Designed as a Symbolic Perpetuation of a Proud Reputation," Interior Design 44, no. 1 (Jan. 1973): 72; PhotoCrd: Alexandre Georges / 1980 Neiman-Marcus  Warnecke/Le Maire; Chicago, IL in Monica Geran, "Neiman-Marcus in Chicago: The Retail Chain's Nineteenth Store Designed by Warnecke/Le Maire Opens on Michigan Avenue," Interior Design 55, no. 7 (Jul. 1984): 209, 212; PhotoCrd: Bob Shimer, Hedrich-Blessing / 1990 Jasmine by Appointment  Bradley Rytz; San Francisco, CA in Lois Wagner Green, "Jasmin by Appointment: Bradley Rytz Designs a Suggestively Simple Fashion Salon in San Francisco," Interior Design 61, no. 6 (Apr. 1990): 184-5; PhotoCrd: John Vaughan; Polo by Ralph Lauren in Bergdorf Goodman Men  J.T. Nakaoka Associates Architects; New York City in Grant Camden Kirkpatrick, AIA, Shops & Boutiques (Glen Cove, NY: PBC International, Inc., 1994), 74; PhotoCrd: Jaime Ardiles-Arce; Salvatore Ferragamo  Kenne Shepherd; New York City in Edie Cohen,"Made in Italy: Kenne Shepherd Designs Men's and Women's Shops in New York for Ferragamo's Extensive Collections," Interior Design 68, no. 11 (Sept. 1997): 226; PhotoCrd: Toshi Yoshimi / 2000 Carolina Herrera  Yabu Pushelberg; New York City in Edie Cohen, "Uptown Girl: Carolina Herrera Makes Her Mark on the Upper East Side in an Appropriately Luxurious Salon Designed by Yabu Pushelberg," Interior Design 71, no. 11 (Sept. 2000): 266; PhotoCrd: David Joseph; Shoe Salon, Bergdorf Goodman  Randall A. Ridless; New York City in Maria Shollenbarger, "History for Sale: Randall A. Ridless Constructs a Francophile Fantasy for Bergdorf Goodman's Fifth Avenue Store," Interior Design 75, no. 11 (Sept. 2004): 230; PhotoCrd: Eric Laignel; Tom Ford  Studio Sofield; New York City in Annie Block, "Best of Year: Fashion Retail," Interior Design 78, no. 15 (Dec. 2007): 70; PhotoCrd: Bill Jacobson; Hugo Boss  Matteo Thun & Partners; New York City in Linda C. Lentz, "Matteo Thun Illuminates a New Concept for Hugo Boss in New York City," Architectural Record 197, no. 2 (Feb. 2009): 113, 115; PhotoCrd: Paul Warchol; Tiffany & Co.  Kengo Kuma & Associates; Tokyo, Japan in Naomi R. Pollock, "Kengo Kuma Creates a Luminous Jewel Box for Tiffany Ginza," Architectural Record 197, no. 11 (Nov. 2009): 178; PhotoCrd: Masao Nishikawa; Barney's New York  Lalire March Architects; New York City in Raul Barrenche, "Walk-Through: Well Suited," Interior Design 80, no. 4 (Apr. 2009): 91; PhotoCrd: Eric Laignel. 2) Malyak, Kristin. Salon, "Theory Studies: Archetypical Retail Practices in Contemporary Interior Design," 57-95.